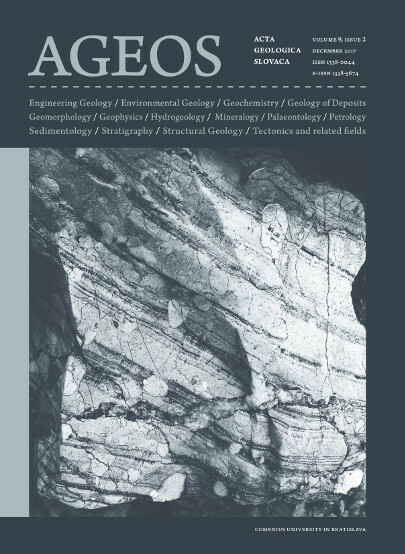 Acta Geologica Slovaca (AGEOS) is an international peer-reviewed journal published by the Comenius University in Bratislava and is available both in printed and open-access electronic version. It accepts original research papers, review articles, and short contributions from the all branches of geology (e.g., geophysics, geochemistry, hydrogeology, engineering geology, geology of deposits, mineralogy, palaeontology, petrology, sedimentology, stratigraphy, structural geology, tectonic geomorphology, tectonics, and related fields). Since 2016, only English written papers are accepted. The AGEOS ensures objective and fair peer review of the manuscript by two or three referees. The identity of the referees can be left to their discretion. The final decision concerning the acceptance or rejection of a paper rests with the Editorial Board and acceptance is based on quality alone. Articles accepted for publication are usually published in order of submission. The journal is published in full colour version. Acta Geologica Slovaca was established in June 2009 and replaced the Acta Geologica Universitatis Comenianae magazine which publishing was cancelled in 2007. The journal is supported by Faculty of Natural Sciences, Comenius University in Bratislava. GRAPHIC DESIGN: Peter Jackanin, Sasida production, Ltd. !! !Acta Geologica Slovaca is indexed in the Scopus database published by the Elsevier!!! Open J-Gate which is an electronic gateway to global journal literature in open access domain hosted by Informatics (India) Ltd. The list of periodicals (The Ministry of Culture of the Slovak Republic); registration number: EV 3721/09.